3yrs ago me and my fiance made the decision to bring a husky into our lives. He was simply jet black and white when we picked him up, but now his coat seems to be irregular and I haven't seen another husky like him. He's jet black along the top of his spine with diluted black/silver sides, but he has a very bright copper-red tail and ear tips. His fur also has a very strong copper color when he's in the sun and slight red tints to the fur just in front of his ears. He did have 2 brothers that were the same copper color, one a piebald and the other a typical coat pattern, but I've never heard of a dog getting mixed coat colors like that. 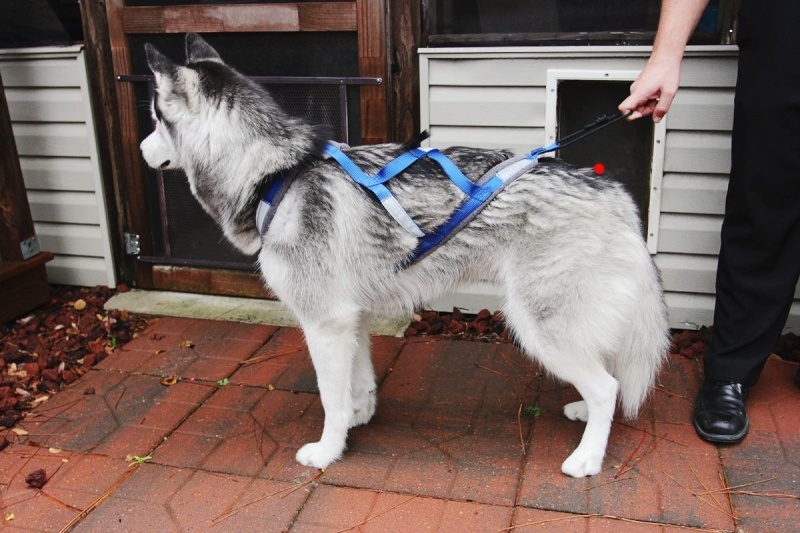 His undercoat is also a silvery tan color, slightly more reddish along the sides of the dark stripe down his back. After checking different sites showing the colors they can be, I looked at individual strands and it seems to be irregular as well with a cream base, a copper red band, and a black tip. He also seems to have faint "tiger stripe" markings, similar to brindle dogs, but widely spaced out and much fewer in number. I'd post pictures, but its hard to get him to hold still long enough and our camera never does the colors any justice. As far as the stripes, they aren't uncommon. My boy has stripes as well though they aren't super pronounced. Could you maybe post a photo? From what I have read, definitely sounds Agouti to me. Would love whatever pictures you can muster. the red tips on his ears don't show up as good from the front, but they are fox red on the back of his ear. These are the best I can do though, sadly. Agouti was actually what I figured he would be, but the definition says that the base of the hair should be black, which Xy's isn't. If not agouti, then sable is the only other coloration I could think of with his fur coloration. Also is he out in the sun a lot? Sun bleaching can actually make the black fur look more red. Though I don't know that it'd be as drastic as the photos show. Just before I bought Kohdi, I was visiting a different breeder and she had a black and white that had the reddish hue like in your pic "reddish hue in sun"...on her facebook page she talked about it because she wanted to show him and it was stated that the coat was *sunburned* and she was having a difficult time, although improvement was made, getting his coat back to normal. But only that one pic of yours looks like that, the others look like the the reds are really parts of his color. Its beautiful!! but I can't tell you what coat color it is. That coat looks sun damaged, not Agouti nor Sable. He does spend a lot of time in the sun now, but his coat has had the red hue to it since he was a yr old and we weren't letting him out as often then due to some health issues. He was still jet black then though. The rest of the changes have all been after that. He did have a faint band of cinnamon color to him when he was around 4 months old, but it faded out around 6 months old and came back for a few months from 12-13 months old. If the coat, which is black, has browned without much sun exposure you should have his Thyroid checked. Beyond that I'd suspect a dietary deficiency. That is classic damaged black coat. Agouti coat presents in the guard hair which will be tri-banded. The guard hair itself will be black at the base, tan middle, and black tipped. Sable is only double banded, the majority of the guard hair (individual) will be tan, the tip is black. Thanks for the info! We have a vet apt coming p so I'll bring that up with them! I'd definitely say that is more of a Sun damage type of appearance. If he hasn't changed drastically from the other colors- then I'm not sure what else. One of our puppies- Loki, was dark when we first met him, he then shed out a few weeks later when we picked him up to a light brown ( like a timber wolf color) He has then since switched to being black/brown/ and whiteish tan points. But almost gets extremely black in the summer time. If it was something like that, with him being such a young age I would question if it was a coat shed but seems highly unlikely. 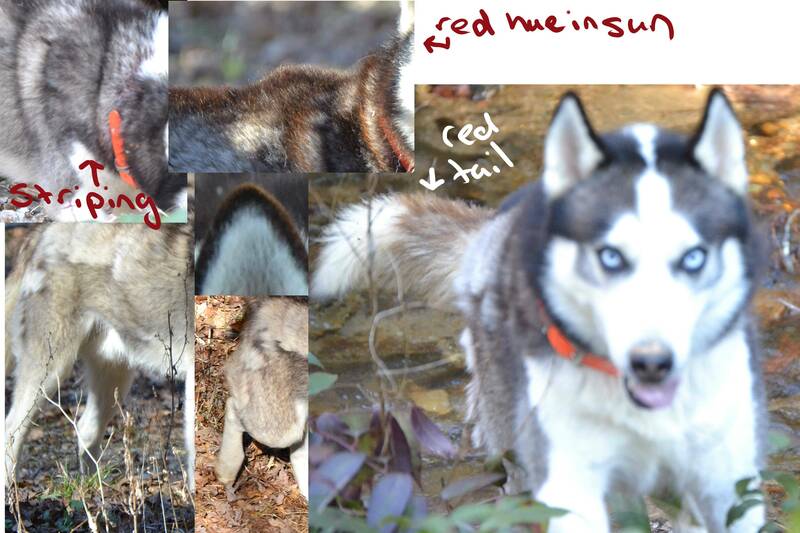 Subject: Re: Odd Husky Coat Color?